Let’s start with SW1 switch configuration. First I have to add two VLANs 100 and 200, and describe these VLANs labnario100 and labnario200 respectively (description is optional). Both switches should be configured at exactly the same way, so SW2 configuration is omitted. As you see, Ge0/0/10 interface is working as a 802.1q trunk. Only VLANs 100 and 200 can pass through this trunk link. PC201 can successfully ping PC202. It means that our VLANs, trunk and access ports are configured correctly. 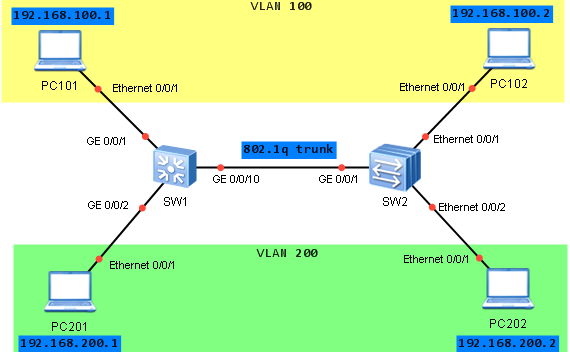 As the last step I want to show you, how to configure VLAN interface. VLAN interface is a Layer3 virtual interface configured on a switch, which belongs to a specific VLAN. It is sometimes called a “SVI” (Switched Virtual Interface). If there is no VLANIF configured, it is not possible to ping any device connected to that VLAN. This is because IP packets must have source IP address to be able to reach remote device and come back to our switch.